I've been thinking about moulding planes, hollows and rounds, and planes in general a lot lately. I've been psyching myself up to possibly make a few in the future but I tend to let ideas digest for a good long while before I act on them. A big part of the marinating process is researching until I feel like I have a solid grasp on the whole concept and can visualize it in my mind. Moulding planes will deserve a significant amount of this navel gazing before they come to light. I spent a while the other day perusing the profiles in the Benjamin Seaton Tool Chest book and later that night cracked open my copy of "The Book Of Plates" from Roubo's "L'art Du Menuisier." I love pulling this book down and looking inside, every time feels like an occasion. The plates are packed full of information you don't need the text to decipher. Not wanting to crush my scanner under the weight of the book, nor impeach upon Lost Art Press's superior scans, I'm using some slightly cleaned up scans from the New York Public Library's Digital Collection in this post. The detail in the plates is . . . There was the initial sonic boom as the book landed in people's mailboxes, but shortly after that settled down, I've heard next to nothing. I certainly would have thought, by now, we would be seeing more representations of the tools shown on the plates. Following the effect of Plate 11 and it's workbench, I thought there'd be more showings from Roubo's tool chest on the horizon by now. 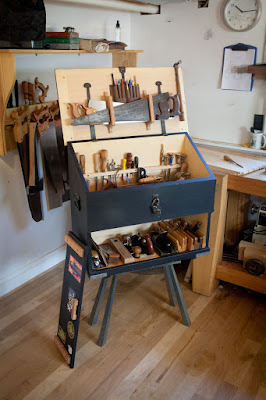 I know we've accustomed ourselves to the English and American style planes of the last few centuries and the modern maker's efforts have been to reproduce these familiar and effective tools. but there is something different about the planes Roubo is showing us and it seems to me like it's been passed over as part of a really cool book and that's about it. Looking at the plane profiles above I'd say these planes, the complex moulders and beaders, are used perpendicular to the surface instead of the skewed angle I've become accustomed to, but the blades are bedded at a skewed angle. I also see more evidence of sidewall blades or "nickers" but there is a ton here to be explored. Even the Kerfing Plane may not be as novel as we've thought. Of course this could be a dado or stair saw, but in the lower corner of the plate shows two men working at benches and one of them is resawing a board with a bow saw. It's been my observation that when these guys show up, their work is related to the tools shown in the plate, thought they are often not using the exact tools in the plate. These tools, more that the moulding planes, deserve to be built and explored by our hands. 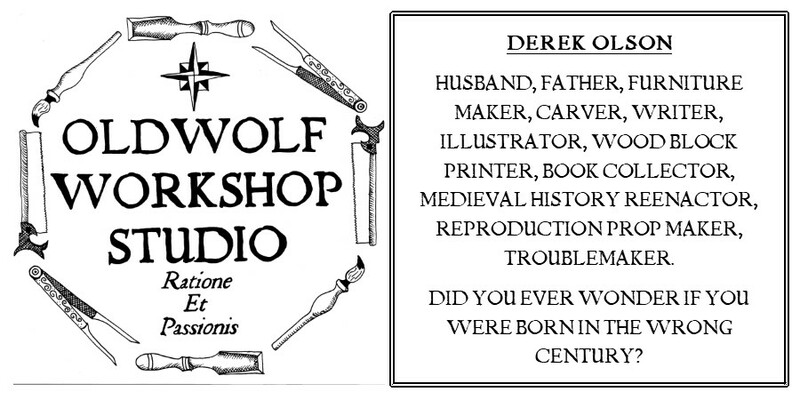 Some have made the tools he's shown. Brian Eve over at Toolerable made some planes I like very much. Heck I got an article in Popular Woodworking from the veneer press vise shown on Plate 280. There are a few others out there but I haven't seen as much as I thought I would, especially from the tool makers, and that's a shame. I may just have to explore more myself, there are, of course, other things to do first. My moulding planes are so close to being done. Really, they are pretty easy. I have a few more ideas about this form that I will explore in the next set. Caleb James made a moulding plane that looks a lot more like the one in Roubo's drawing. He posted it to his Instagram a couple weeks back. I hope to hear more from him about his experience with it. Thanks Brian, I missed Caleb's instagram post but went back and found it! Too bad you can't make out more. 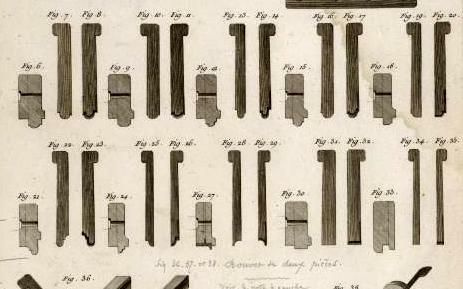 The saw shown in figure 14 of plate 17 isn't a kerfing plane, it's a "scie à araser", with an "arasement" being the "shoulder" portion of a tenon. The shoulders are sawn across [i.e., not parallel to] the workbench, although at a slight angle, overhanging the bench on the crochet side [left-hand side], in order to prevent damaging the companion shoulder. 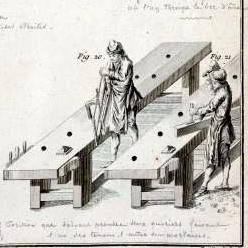 There is as well a saw for sawing shoulders that one calls a "scie à arrazer" [a shoulder saw], which is composed of a body of around nine to ten inches in length, on which is attached a saw blade of the same length: this tool is used to saw the shoulders of [presumabled framed] ledged doors & other tenons of great length, in pressing it against a strip of wood that one attaches along the length of the line to be cut (Fig. 14). But in general an ordinary saw does the same thing when it is well adjusted. Thank you Andrew!! A translation is a fantastic thing to have I appreciate you posting it. Now I just have to figure out how to work "arasement" into my daily vocabulary. 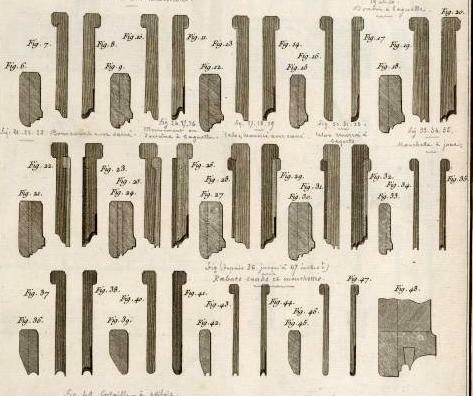 And the two men in the plate are, as you'd guessed, related to what was being described in that section of the text, although that section of the text concerns the creation of mortise and tenon joints, and not resawing ― the guy on the left is sawing the cheeks of the tenon (Fig. 20), the guy on the right is chopping the mortise (Fig. 21). That makes sense too. Looking for one thing and seeing another I guess, I can see it all now with the board on the benchhook to the left as well. For furniture, hollows and rounds and a rabbet plane is all you need if you want to go beyond a simple scratch stock or just gouges. The complex molders don't come into their own until you are doing production work. I'll try to remember where it is but on a French archive site is an old film where they actually are using that kind of saw to cut tenon shoulders. Theirs had a clamping frame that you mounted the piece on and then the rail around it was a guide plane for the saw. I totally agree about the H&R's and rabbet being all you really need, however I do like having a couple complex moulders to fall back on. I never did find the video but the basic principle is a frame with a clamp that acts as a fence as you saw around the tenon.